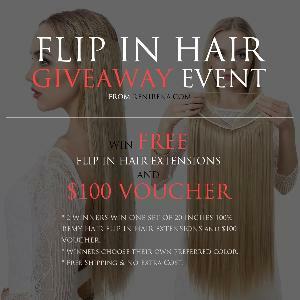 Prize: Flip In Hair Giveaway * 2 WINNERS WIN ONE SET OF 20 INCHES 100% REMY HAIR FLIP IN HAIR EXTENSIONS and $100 VOUCHER * Winners choose their own preferred color. * Free Shipping & No Extra Cost. What you must do to enter: If you wanna win a flip in hair, please join our giveaway event. You will have chance to win a free one. Everyone will get a 20% Off discount code when enter. Statistics: This contest was opened by 117 and entered by 7 ContestChest.com members. 6% of those who opened the contest, entered it.